Easy on the eyes and very comfortable, this sofa bed is a great addition to your home. With its faux leather upholstery teamed up with chrome legs, this sofa bed has a classic design that will work in traditional contemporary spaces. You can easily set it up to become a chaise lounger or as a sofa bed sleeper. When it is set up in chaise function, it has 61.4 inches in length, 30 inches in width and 32 inches in height. Once you set it up to its sleeper function, it goes up to 70 inches in length, 30 inches in width and 15.4 inches in height, allowing this sleeper to accommodate more guests. We like the classic design of this sofa bed. 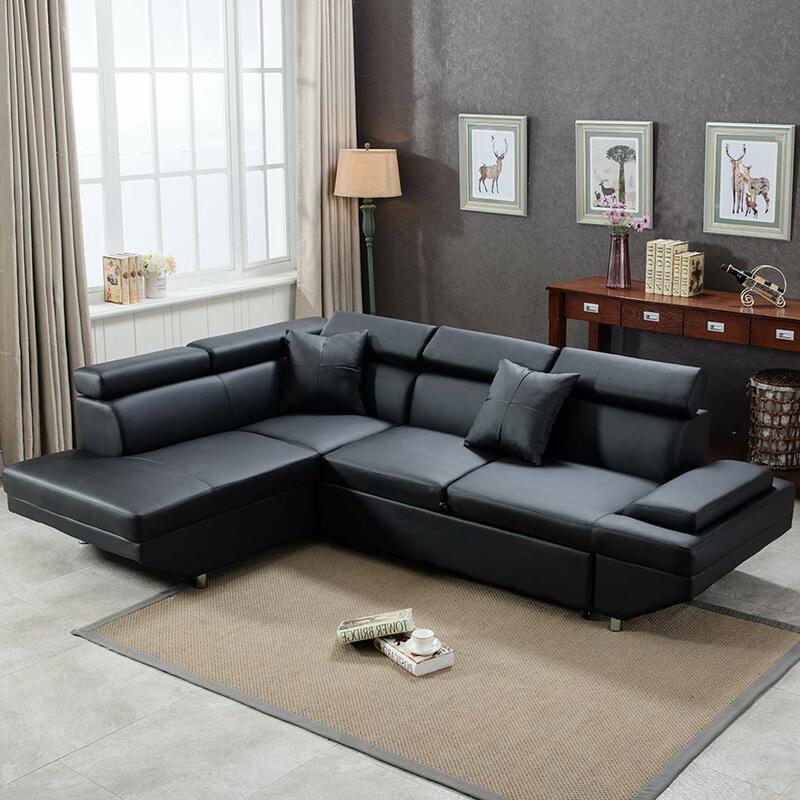 The leather tufting looks elegant and really does a good job in elevating the look of a space. You can have an ordinary guest bedroom and make it look better with the help of this sofa bed. It does offer a lot of comfort. The material itself is soft and the padding is comfortable You can actually sit on it for hours and still feel comfortable. A lot of users said they did not have issues assembling this sofa bed. It did come in two separate sections and the first one is delivered earlier, so buyers had to wait for the second part before they were able to assemble it. Once it arrives, assembly is a cinch. There were those who were able to assemble it in just 30 minutes. It is quite a versatile piece. You can set it up L-shape for that classic sofa look and then switch it up to bed functions with ease. It is sturdy. Some said three people over 200 lbs. each were able to use this sofa bed without issues. The legs finished with chrome hold up heavier loads well. It doesn’t come with armrests, which would have added up to its comfort and functionality. Some also said it is not really white in color but more of cream. What’s not to love about this modern sofa bed? It has a frame made from solid wood, which means you get to enjoy your sofa bed for many more years to come. The PU leather material used in upholstering this sofa bed is resistant to damage. It is waterproof, dirt-proof and even wear-proof. If you don’t want to spend so much time maintaining your sofa bed, this is a great choice for you. As a sofa, it beats many of the traditional sofas out there. Its adjustable headrest allows you to sit back and relax while watching your favorite TV show. The foam is made from a high resilience sponge. It has elastic properties that conform to the body and returns to its original shape once done using it. This sofa bed will fit modern rooms well. It is well-designed and is attractive enough to be used even as a primary couch. It converts into a bed so easily. You don’t need to do a lot of tweaking. It is huge. It is probably one of the biggest sofa beds out there. Your guests will have more room to get comfortable on this bed. Assembly is quite easy. It comes in two separate pieces, so you can easily fit it through your doorway. People said they were able to assemble it in mere minutes. One of its best features is its wear and dirt-resistant material. If you accidentally spill something on it, simply wipe it with a clean cloth and you are good to go. It doesn’t get dirty easily as well, so if you are looking for a low-maintenance kind of sofa bed, this is a great choice for you. It is comfortable. The adjustable headrest is a nice feature. It comes with armrests as well. You can sit on it for hours while watching TV and not feel the discomforts. The bed pulls out easily. There is no complicated set-up when you have unexpected guests over. Everything feels and looks well-made and durable. There were those who said it feels too lightweight. Some also said there are permanent imprints on the couch headrest. It’s actually not easy to find a sofa bed that is convenient to use and comfortable at the same time. Usually, it’s one or the other. But this sofa bed delivers the perfect balance between these factors. Being a sofa bed with a memory foam interior, you can be assured that this will provide you or your guests with a lot of comfort. Memory foam is a foam technology that conforms to the contours of the body by just following the heat emitted by your body. It is very simple to use and doesn’t require lengthy installation and assembly. Simply flatten the backrest to get a decent-sized bed. It is very easy and convenient to set up. You don’t need to carry heavy parts to assemble the bed. Simply flatten the backrest and that will do the trick. The material used is very soft. Coupled with a memory foam material, this sofa bed is just as comfortable as your traditional and primary bed. It doesn’t sink or sag easily. It holds weight well and doesn’t get saggy after many uses. It also feels quite sturdy even when heavier people use this sofa bed. They said they can move around the bed without the bed getting wobbly or unstable. The armrest can be adjusted. This will help customers set this up to their preferred level of comfort. The back is also adjustable. You can recline it to your preferred setup. It is on the small size. Two people might fit but might not provide enough room to move around. Perhaps the coziest sofa bed you can get is this one. It is not a pull out bed or a convertible one but a bed that looks like a couch at the same time. It eliminates the need to set up the bed before sleeping. We can safely say this is your most durable choice because of its sturdy construction and materials. Made from Kiln-dried hardwood frame and strong textile upholstery, this is a sofa bed you can rely on whether as a sofa or as a primary bed. It also features a flex slat support function that gives the bed the sturdiness needed for everyday usage. You can also customize it to your preferred layout with its right or left lounge position option. Get this sofa bed if you want something that will last you for a long time. It has a solid and durable construction that should be able to withstand a good amount of abuse. The Kiln-dried hardwood frame supports heavier loads. You can customize it to your preferred setup. You can choose a right lounge position or switch it up to a left lounge one. The pillow back is tufted. It also comes with a side lounge panel, so it feels like you are being ensconced. A lot of people find this structure comforting. The European bentwood slat system means you don’t need to buy a box spring for it. The canvas cover has a nice texture that people might find comfortable. For a sofa bed, it is quite affordable. It also has a nice full size that can accommodate 2 people. Some said they did not like the height. It is low to the ground. Which Sofa Bed Should You Get? Now which of these sofa beds is really the perfect choice for you? Best Size and Capacity: Emily Modern Sofa Bed. We recommend this if you are looking for a good-sized sofa bed that can accommodate more people. It is large but doesn’t take up a lot of space. Even when using it as a chaise lounger, it can sit a lot of people. This is overall a great choice for people who frequently have friends or family over. Low Maintenance: FDW Sofa Sleeper Couch Bed. Who has time to do rigorous maintenance on their couch, right? If you spill something on it, you would want something that you can simply wipe with ease. That is what this sofa bed can offer you. The material makes it easier to maintain. It also maintains its clean appearance for a long time, so you are not saddled with a lengthy maintenance routine. Best Comfort: Mainstay Memory Foam Futon Sofa Bed. We highly recommend this sofa bed to those who are serious about getting comfort in their extra bed. Because of its memory foam interior and plush exterior, this has comfort that feels like a primary bed. Since the armrest and the back can also be adjusted, it caters to your specific comfort needs. Best Durability: D&H Tufted Reversible Sofa Bed. The sturdy materials and extra support this sofa bed can provide ensure this will last you for a long time. Get this bed if you are looking for something that can withstand heavier loads and has the support that is similar to that of a traditional bed. 1. Consider the kind of setup you want. As you know, sofa beds come in different forms and sizes. Decide what kind of setup and technology you prefer first. Do you want a pull out bed or do you prefer something convertible? Do you prefer not having to set up anything like a sofa bed couch that you can use as is? If you still need to convert it, it can be a hassle to use as it will take a few more minutes to set up the bed. Ultimately, it will boil down to your personal needs. 2. Look for a sofa bed that will fit in the space you want. Measure the space you want to place the bed in. Once you measure the space, look for a sofa bed that will fit in the space. Also get its measurements once the bed has been set up. It might fit in the space in sofa form but might not offer the same thing once it is in bed form. 3. Make sure it is comfortable. Find out what foams are integrated. Is it thick enough to cover the frame and mechanisms of the sofa? If the bed foam is too thin, the frame might protrude, which can diminish its comfort. If you can sit in it for hours without feeling discomforts, it should be good for sleeping as well. 4. It should be easy to maintain. Are there materials that still need to be thoroughly cleaned? You would want something that you can easily vacuum or wipe off. We can help you in finding the right beds that are suitable for different needs and purposes. Do check out our homepage for more bed and mattress reviews. You can also read reviews to help you narrow down your choices to the best ones.